Blade: Hexagonal throughout with impact cap, hexagonal bolster. The softer ''anti-slip'' zones provide increased grip, enabling the low-loss transfer of high forces. Wera Kraftform Plus 932/6 6-piece set. For Slotted and Phillips screws. The Kraftform handle ensures rapid hand repositioning without any danger of the skin sticking to the handle. Wera Kraftform Plus 932 S/6 6-piece set. For Slotted and Phillips screws. Slotted and Phillips screws, impact cap with integrated square socket for insertion of 1/4'' blades for higher torque. Wera Kraftform Plus 977/6 6-piece screwdriver set. For Torx screws. The outstanding design of the Kraftform handle fits perfectly into the hand. The Kraftform handle ensures rapid hand repositioning without any danger of the skin sticking to the handle. The WERA 05024401001 Torx Screwdriver Kraftform Plus 977 is one of thousands of quality tooling products available from MRO Tools. Please browse Wera 900 Series Kraftform Plus Chiseldriver Screwdrivers for tools similar to the WERA 05024401001 Torx Screwdriver Kraftform Plus 977. WERA 05024401001 Torx Screwdriver Kraftform Plus 977 description summary: Wera Kraftform Plus 977 Torx Screwdriver. 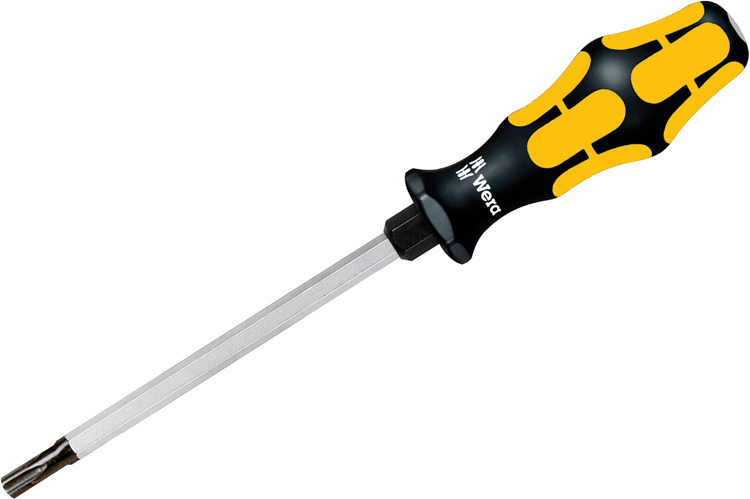 Point Size: TX 20 Hex Diameter: 5mm Shank Overall Length: 90mm / 3 1/2'' Handle Overall Length: 98mm Quantity discounts may be available for the WERA 05024401001 Torx Screwdriver Kraftform Plus 977. Please contact MRO Tools for details.